Are you ready for the two piece set you've always wanted? You're in luck, the Sunkissed Maddy Two Piece Set is finally here! The lace detailing is a gorgeous feature on this two piece set, and you'll love the ! 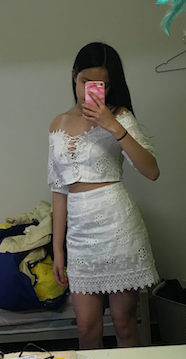 Filter By Height: Show All 4'11" 6'2"
I purchased this out fit and the skirt fits amazingly. The problem is the top is a weird fit. I thought maybe I was too small for the top but i got a few friends of different build to tr it and it sits awfully on all of us. So cute, but a bit difficult to put on the top! The top is a bit too big for me but the skirt is perfect. I like how it looks overall but the quality of the strap is a bit disappointing.